We work hard to protect your investment. COB BLASTING is the best solution for removing old failing stains and finishes from log homes. Unlike chemical strippers, it is completely non-toxic and safe for the environment. Unlike pressure washing, it is a completely dry method, so there is no need to wait before applying stain. There is also no concern of water or chemicals entering your home. Secondly, our specially designed blast pots allow us to dial down the pressure so as not to remove an excessive amount of wood. 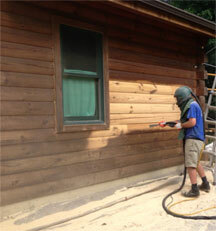 Cob blasting and refinishing your log home is a great way to protect and enhance your investment. If you’re like most people, your home is one of your largest investments you’ll ever make. And like any investment, it needs to be cared for and properly maintained. If your log home is poorly maintained or neglected, its value can plummet. By properly removing failing finishes and applying a fresh new finish, your home’s true beauty can shine and will be worth much more. Check out our frequently asked questions page, and if your questions aren't answered there, please contact us. To add value to our customers’ businesses, homes, and lives by beautifying, protecting, and maintaining their investment. To add value to the lives of our team members and their families by creating an atmosphere in which hard work, integrity, and dedication are celebrated. To add value in every circumstance by always treating others as we would like to be treated. Our focus is to make sure our customers are happy with the results. We take pride in what we do, and it shows. View flipbooks containing homes restored from start to finish. "Very professional and personable. We couldn’t be more pleased with their work and how our cabin was brought back to its natural wood beauty." Copyright © 2017 Blastmaster Surface Restoration, Inc.